Located on Bray's Main Street. The Victorian seaside town of Bray, Co. Wicklow, is a tad shy on good eateries, so when I heard that a new Indian restaurant, Pink Salt, was opening, I was out there pronto. Located in an upstairs premises at the Town Hall end of the town, it originally housed Shelby’s restaurant, in the good times, and subsequently a Greek and a Lebanese restaurant for two brief incarnations. 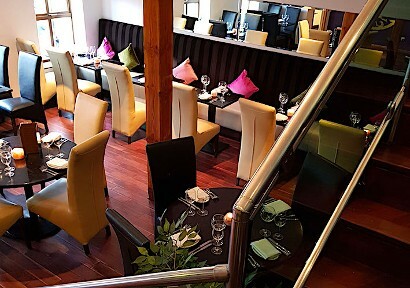 The team behind Pink Salt have a good pedigree, having all worked between them at Nisheeth Tak’s fabulous Rasam in Glasthule, and for Asheesh Dewan’s superb Jaipur Group. Setting up a new restaurant is always nerve-wracking, and Maitre’d Jithin did a double take on spotting me, when I rolled up on their first Sunday evening of opening with Sir in tow, as we were being seated quietly in a corner by a delightful young waitress. On top of that, all the local Indian food aficionados seemed to have already discovered them and were pouring up the stairs behind us. It’s a big modern space over two floors, and features the all important colour and life – it just felt good. “They’ll do alright here”, I said to Sir, who nodded in agreement, chomping on poppadoms and dips as though there was no tomorrow. Pink Salt, incidentally, is a Himalayan rock salt that is supposed to be good for you – like everything else nowadays! A dozen or so starters included Punjabi samosas; Malai tikka - cream cheese and cardamom marinated tandoori grilled chicken; and prawn chilli Andhra – a sizzling affair of juicy prawns coated with star anise and chilli, black salt and coriander. Calamari was there too as well as a Himalayan pork fry. A good way to get an overview of starters is with their selection platter. Sir went with aloo tikki, crispy fried spiced potato cake, dressed with tamarind and honey, while I had Kerala jhinga, a brace of fab spiced jumbo prawns, pan seared and presented with fresh mango and melon salad. That’s a must have! Mains sported all the popular dishes of the sub-continent, from prawn jalfrezi to lamb rogan josh, tandoori lamb shank to chicken tikka masala, Allepey coastal fish curry to a Mansahari thali, which again gives you a selection of dishes. We were attracted by two traditional dishes, which we haven’t really had for a long time, chicken korma and basmati rice for Sir, and Lucknowi biryani and peshwari naan for moi. People associate korma as being very mild and bland, but Chef Anubhav’s was a masterfully aromatic version (as I would have expected) – a lovely pale golden colour reflecting the colours of mace, dry rose petals, cashew nut and cardamom. The lamb biryani, with its aromatic spices, ginger and basmati rice, was equally delicious. Desserts included ice-cream and sorbets as well as malai kulfi, homemade Indian ice-cream served with rose scented basil seed, but I decided on hot gulab jamun, a delicious soft milk based Indian dessert, which looked like two little nutmeg coloured balls sitting in a honey syrup with a scoop of vanilla ice-cream on the side and mango coulis dots. A great addition to Bray.